This iconic skincare product will keep your eyes looking young and fresh. The area around the eyes requires utmost care for many reasons. Because of the shape of our eyes, for instance, they're prone to the accumulation of fluids that can lead to dark circles and puffiness. The skin around our eyes is also thinner than that of the rest of our bodies, so it tends to show more signs of strain, stress, and aging, making a proper skincare regimen crucial to prevent these. One of the world's most popular eye creams is The Eye Concentrate by La Mer, an award-winning wonder often credited for dramatically reducing signs of aging around the eyes. Below, a closer look at its features and why many regard it as a cult classic. It shares the same history with the iconic Creme de la Mer. La Mer founder Dr. Max Huber, a German-born aerospace physicist, created the Miracle Broth in Creme de la Mer in the '50s. A product of over 6,000 experiments in a span of 12 years, the Miracle Broth then found its way in the Eye Concentrate in 1965 as a way of harnessing the benefits of sea ingredients. All the key ingredients of the Eye Concentrate are ferments, making the product more special. La Mer's choice ingredients and their fermentation process are perhaps what set the brand apart from others. Sea kelp (Macrocystis pyrifera) are harvested by hand, packed in temperature-controlled containers, and shipped to the La Mer labs on the same day. All the crucial elements of the Eye Concentrate, from its sea kelp to plant extracts, are then bio-fermented for three to four months to produce a more potent formula that's beneficial to the skin. The Eye Concentrate features triple the concentration of La Mer's legendary Miracle Broth. While the Eye Concentrate retains the original fermentation process of the Miracle Broth--even using Huber's sound waves during the fermentation of the algae--the broth has been made to be more hard-working by existing in three forms. First as an essence through the Original Miracle Broth, which is crafted by harvesting kelp twice a year and combining it with natural ingredients such as calcium, magnesium, citrus oil, eucalyptus, alfalfa, and sunflower. Bio-fermentation allows the release of vital energies, resulting in the Miracle Broth we are familiar with. The other two forms are equally vital. The Concentrated Miracle Broth is a thick serum that resulted from the Original Miracle Broth undergoing a three-day vacuum process, thus letting the Eye Concentrate help soften, nourish, and hydrate the skin. Meanwhile, the Encapsulated Miracle Broth is the Original Miracle Broth in powder form, devised to continuously help hydrate and soothe skin with regular use. It uses minerals to maximize the effect on the skin. Along with the three forms of La Mer's iconic Miracle Broth, the Eye Concentrate also makes use of Magnetized Hematite, whose magnetic energies are responsible for re-energizing and revitalizing the eye area to help it stay firm and toned. It also utilizes a silver-tipped applicator to help cool and calm the skin, helping improve blood flow and circulation. In each application, only the necessary amount is picked up to maximize the effects of the Eye Concentrate. You can use the Eye Concentrate alongside two more products for a complete routine. For the ultimate eye rejuvenation, combine the powerful effects of the Eye Concentrate with La Mer's Lifting Eye Serum and Eye Balm Intense. Begin your eye care routine with the Lifting Eye Serum, formulated to help tighten the skin around the eyes and create a lifted and contoured look. If you want to moisturize and hydrate your delicate skin, apply the Eye Concentrate. If you need a richer product to help combat signs of aging and protect against further damage, use the Eye Balm Intense. 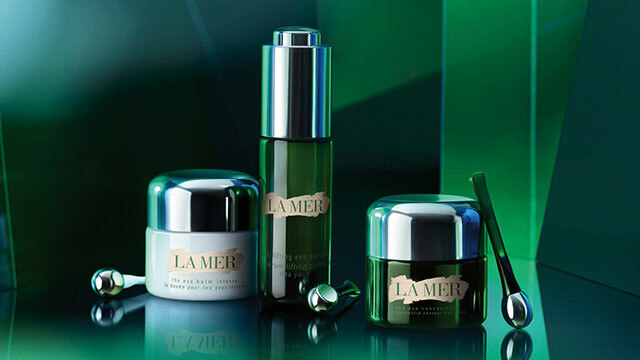 Find out more about La Mer's signature eye products by visiting its website. La Mer is exclusively available in Rustan's Makati, Shangri-La, Alabang, and Cebu.